The 3rd GOP Debate! My Synopsis! The 3rd GOP Republican debate started off with the CNBC debate moderators introducing themselves, which is very important for most of us, because no one has ever heard of these people. They are Carl Quintanilla, Becky Quick, and John Harwood. The rules were given, which basically were that candidates had 60 seconds to answer questions and 30 seconds for followups and rebuttals. This immediately gets forgotten about, because this debate was a free for all. These moderators had no idea how to actually moderate and seemed to think the debate was between them and the candidates. The candidates in the debate were John Kasich, Mike Huckabee, Jeb Bush, Marco Rubio, Donald Trump, Ben Carson, Carly Firoina, Ted Cruz, Chris Christie, and Rand Paul. At least three of these people should not even have been in the debate. I won’t mention their names, so you’ll have to figure out which three. The first question was, “What is your biggest weakness and what are you doing to address it?” John Kasich began by going on a rant about how he has heard candidates who want to do away with Medicaid and deporting 10 or 11 million people “here from this country, out of this country.” Yes, he said “people here from this country, out of this country.” Then he went on about how we need somebody who can lead, balance budgets, and cut taxes. He never even came close to addressing the question. Huckabee said he doesn’t have any weaknesses, but that his wife could probably list some. Then he said that if he had a weakness it’s that he tries to live by the rules, no matter what they are and that people are sick and tired of Washington not playing by the same rules the people have to play by. Bush said that he is impatient and can’t fake anger and that it troubles him that people are rewarded for tearing down this country. It seemed like his complaint was about the conservative base complaining about the GOP establishment RINOs. He said we’re on the verge of the greatest time. What? Rubio seemed to agree with Bush. He said he isn’t sure it’s a weakness, but he shares a sense of optimism that he is afraid is eroding from the people and there is a sense in this country that somehow our best days are behind us. Maybe Rubio doesn’t see what the American people see, that at this point, our best days are behind us. Trump said that his greatest weakness is that he trusts people too much and when they let him down he never forgives. Carson’s weakness was not really seeing himself in the position of President until 100’s of thousands of people began to tell him that he needed to run. He said he believes in Reagan’s 11th Commandment and will not be attacking the other candidates. Fiorina claimed that after the last debate she was told she didn’t smile enough. Then she smiled and laughed. She mentioned that the government is corrupt and works only for the big, powerful and well connected and that we need a leader who will help us take our government back. When Cruz was asked his greatest weakness he said, “I’m too agreeable; easy going…” The audience laughed and then he said, his biggest weakness is exactly the opposite, he’s a fighter, passionate about what he believes in and his whole life has been passionate about the Constitution. He said that if you want someone to grab a beer with, he may not be that guy, but if you want someone to drive you home, he’ll get the job done. Christie said that he doesn’t see a lot of weakness on this stage and that where he sees weakness is in the three people left on the democratic stage. He sees a socialist, an isolationist, and a pessimist and can’t figure out which is which. Finally, Rand Paul, went straight to talking about the national debt and the bill that just got put forward in Congress which will explode the deficit and allow Obama to borrow unlimited amounts of money. He says he will start filibustering it tomorrow and urged everyone to call their congressmen to put a stop to it. John Harwood started some actual questions by addressing Trump. He listed the things Trump wants to do, such as building a wall and making Mexico pay for it and Trump agreed with each point, even though they were made in a snide manner. Then Harwood asked if this is a comic book version of a presidential campaign? No bias with these moderators, obviously! Trump said that it wasn’t a very nicely asked question and then gave CNBC’s Larry Kudlow as an example of an economist who loves his tax plan. He explained the tax plan briefly and then addressed the wall, saying we’re going to build it and let people in, but only legally. He said they built the Great Wall of China 13,000 miles long and all we really need is 1000 miles of wall. We’re going to have a big, fat, beautiful door, right in the middle of the wall. The first 60 second time limit went out the window and Harwood started arguing with Trump about his tax plan, so Trump said, “Then you’ll have to get rid of Larry Kudlow who said, ‘I love Trump’s tax plan! '” Then Bush tried to chime in, but got shut down by Becky Quick. Becky Quick questioned Carson on his tax plan and quoted some liberal economists who say it won’t work with a 10% flat tax. Carson said that he never claimed it would be 10%, but that he only made a comparison to tithing, which is normally 10% and that the rate would be closer to 15% and you’d have to get rid of deductions and loop holes along with strategic cutting in federal agencies. Quick kept trying to argue and cut Carson off. Kasich broke in and said that this was a fantasy. Waving his hands around in that weird way that only he and Bernie Sanders can do, he went off on a rant about not making promises to cut taxes and why not promise a chicken in every pot. He went on his scripted rant about how everything has improved in Ohio. He said that these tax cut plans are fantasy, just like getting rid of medicare and medicaid. He fails to understand that Medicare is unconstitutional to begin with. Then he made fun of shipping 10 million Americans out of this country. Yes, he said “Americans.” He tried to correct himself, but Freud already had his slip. Trump broke in and said that John Kasich got lucky with a thing called fracking! That’s why Ohio is doing well. Then he nailed Kasich for being a managing partner at Lehman Brothers when it went down the tubes almost taking Trump and Carson with it, as share holders. Trump said that Kasich originally claimed that he wasn’t going to attack anyone, but his poll numbers tanked, so now he’s getting nasty. Kasich tried to rebut, with more of the same about his record in Ohio and Trump turned and winked to Ben Carson. Fiorina said that we’ve been talking about tax reform in D.C. for decades. We now have a 73,000 page tax code. There are lots of good ideas, but we never get it done. The big problem is that we need a leader in Washington who knows how to get things done. Carl Quintanilla interrupted and asked her about her idea to get the 73,000 pages down to 3 pages? Is that using really small type? No bias here folks. She said, no, because only by getting it down to 3 pages can you level the playing field between the big who can hire armies of lawyers and the small, regular people and that 3 pages is about the maximum that an average person can understand without hiring somebody. Carl Quintanilla addressed Rubio with points such as his support for amnesty, which he says he no longer supports and now he is skipping more senate votes than any senator to have run for president, so why doesn’t he slow down or at least finish what he started. Rubio said, that’s exactly what the Republican establishment says too. Why don’t you wait in line. Quintanilla quoted the Sun Sentinel calling for Rubio to resign, not rip us off, or to do his job, or that he acts like he hates his job. Rubio attacked that as evidence of the bias in the media. He mentioned the Sun Sentinel’s endorsement for Bob Graham who missed 30% of his votes while running and John Kerry who missed 60-70%. Then Obama missed 60-70% of his votes and the same paper endorsed him. The crowd roared. Bush broke in and took Quintanilla and the Sun Sentinel’s side. Rubio said that he has been listening to Jeb talk about how he is modelling his campaign after John McCain, but Bush never complained about John McCain’s vote record and that the only reason Jeb is complaining about Rubio’s is that they’re running for the same position. In a very long winded way, Harwood asked Bush why his campaign is failing when he has so many rich donors. Bush’s answer was just as long winded, about how the American people don’t believe in building walls and don’t have a pessimistic view of the future. Becky Quick drilled Fiorina on her board chairmanship of HP and getting fired. Fiorina’s answer was the same as it always is, the whole NASDAQ was down and the guy who lead her firing, Tom Perkins, later claimed that firing her was a mistake. Carl Quintanilla brought up that congressional republicans and democrats are about to strike a compromise to raise the debt limit and prevent a government shutdown. If only the government would shut down! He asked Cruz if his opposition to this bill showed that he is not the kind of problem solver that American voters want. Assuming that if you aren’t a liberal, American voters don’t want you. Again, no bias here… Cruz responded by saying that the questions that have been asked by these moderators illustrate why the American people don’t trust the media. The crowd applauded! He went on saying, this is not a cage match. Look at the questions, “Donald Trump, are you a comic book villain, Ben Carson, can you do math, John Kasich, will you insult two people over here, Marco Rubio, why don’t you resign, Jeb Bush, why have your numbers fallen? How about talking about the substantive issues people care about? The crowd blew up! Cruz said he wasn’t finished and contrasted it with the democratic debate, saying every fawning question from the media was, which of you is more handsome and wise? He said the men and women on this stage have more ideas, experience and common sense than anyone on the democratic debate, which reflected a debate between the Bolsheviks and the Menschaviks and nobody watching the debate believes the moderators have any intention of voting in a republican primary. The moderators then accused Cruz of not answering the question to which he said he would gladly answer, but they wouldn’t let him, cutting him off, saying he used up his time. Harwood moved on to question Paul about the budget deal. Paul answered by explaining how they are just taking money from social security and spending it on other things and that the deficit is exploding as the right and left are spending us into oblivion. Harwood asked why Boehnor proposed the bill and Senator Ryan, who has a reputation for fiscal discipline, voted for it. First time I ever heard that Ryan has fiscal discipline! Paul then questioned if there is going to be any real change in the House of Representatives with new leadership under Ryan. Becky Quick took on Chris Christie asking when it’s acceptable to break a social contract, citing his desire to cut benefits for seniors who make certain amounts of money and wanting to raise the retirement age. In answer to why he would make you wait longer for your benefits and get less, he said the government has lied to you and stolen from you and Social Security is going to be insolvent in 8 years and he’s the only one with a plan to tackle it by making people who have done better get less. Huckabee was given the chance to chime in. He said this isn’t the government’s money, it’s not welfare, it’s your money. This is money people have had confiscated. He said the people not to blame are the people who paid into Social Security. He said this isn’t a matter of math, it’s a matter of morality. Christie broke in and said, it’s not the people’s money anymore, it was already stolen. We have to just tell the truth and stop trying to give them a fantasy. Cruz got 30 seconds to respond and said this deal on the debt limit is an example of why Washington is broken. Republican leadership joined with every single democrat to add 80 trillion to our debt and to do nothing to fix the problems. Then he said that both Huckabee and Christie were right. We need to honor the promises made to our seniors but for younger workers, gradually increasing retirement age, changing the rate of growth so it matches inflation, and allowing younger workers to keep a portion in a personal account. Trump got drilled on his bankruptcies by Becky Quick as if bankruptcies were supposed to prove that he was a poor businessman. His answer explained how bankruptcy gets used by many other big businessmen and Atlantic City has gone bad. He came out ahead by using bankruptcies, used it to his advantage and has created a net worth of over 10 billion dollars. He said nobody can solve debt problems like him and the country is 19 Trillion in debt! Suddenly, out of nowhere, Jim Cramer was sitting with the moderators. They must have tag teamed him in. He asked Carson if the government should control the price increases on medicine. Carson began by citing the average cost that government regulations force on small businesses is $35,000 per employee. He said we need a major reduction in the regulatory influence. The government is not supposed to be involved in every part of our lives and that’s what’s causing the problem. Skipping along past some of the more boring & repetitive parts of the debate, Carly Fiorina ended up giving a good explanation of how government involvement is the problem. The FCC is implementing 400 pages of regulations over the internet, the government wants to tax sales on the internet, big companies join to become bigger companies, thousands of small banks have shut down as big banks join to become bigger banks, because as government gets bigger, everything else has to get bigger to deal with it. She said this is all due to crony capitalism and how socialism starts. Becky Quick attacked Rubio on facing a foreclosure on his home and having debts, so how could he run a 17 trillion dollar economy. I guess she thinks presidents run the economy. Rubio said that he inherited nothing, worked for everything, and when he first got married, had to explain to his wife why someone named Sally May was taking $1000 from his bank account every month. Becky Quick said, “But you had a windfall, you made a million dollars on a book,” to which Rubio fired back and said that he was using that to pay off his college loans and that it was available in paperback. The audience applauded! Becky Quick wanted to know how Cruz would address women making 77% of the wages men make. He said we have to turn the economy around. The Democrats’ answer to everything is more government control over wages and more empowering trial lawyers to file lawsuits. He said that when you see Bernie Sanders & Hillary Clinton talking about wanting to address the plight of working women, not one of them mention the fact that under Barack Obama 3.7 million women have entered poverty and the median wage for women has dropped $733. Fiorina broke in to say that it’s the height of hypocrisy for Hillary Clinton to talk about being the first woman president when every single policy she espouses has been demonstrably bad for women. 92% of the jobs lost during Obama’s first term were for women and Cruz is right. 3 million women have fallen into poverty under this administration. Carl Quintanilla asked Carson why he was be on the board of Costco, whose views are counter to his on homosexuality, since they have domestic partner benefits. Carson said that obviously Quintanilla doesn’t understand his views on homosexuality and he believes the Constitution protects everybody, but also believes that marriage is between one man and one woman. He said that this myth that you can’t believe in traditional marriage and still accept homosexuality is perpetrated by the left to get people to shut up. Those people who are trying to divide us are the enemies. Then Quintanilla asked why Carson remained involved with the company Mannatech, who made claims they could cure autism and cancer, and paid 7 million dollars to settle a deceptive marketing lawsuit. Carson said that was easy to answer, because he was never involved with Mannatech. It is total propaganda and this is what happens in our society. He did a couple speeches for them as he has done for other people. It’s absurd to say he had a relationship with them. “Do I take the product? Yes, I think it’s a good product.” Quintanilla said that Carson was on the Mannatech home page and Carson said that someone must have put him on there without his knowing. Quintanilla asked if that speaks to his vetting process or judgement in any way? Carson tried answering, but the audience booed Quintanilla, resoundingly. Carson laughed and said, “See, they know.” Roaring applause. Quick accused Trump of being very critical of Mark Zuckerberg for wanting to increase the number of H1B visas for legal immigrants. Trump said he was not at all critical of him. Zuckerberg was complaining that we are losing the most talented people, they go to Harvard, Yale, Princeton, then they’re immediately sent out of the country. Trump said he is all in favor of keeping these talented people here, so they can go to work in Silicon Valley. Becky Quick snidely asked, “Where did I read this and come up with this…” Trump said, “Probably, er… I don’t know, you people write this stuff! I don’t know where you get it.” The crowd cheered. Trump went on a tirade about Super PACs and how they need to be gotten rid of, because they are spreading dishonesty. Quick replied by saying that Trump accused Rubio of being Zuckerberg’s personal senator. Trump said that he never said that. Rubio was brought up, so he responded and said that the democrats have the ultimate Super PAC, the Mainstream Media. He said that Hillary Clinton spent a week running around telling everyone Benghazi was caused by a video while her e-mails to family have just been exposed and show she knew otherwise and the mainstream media is running around saying that this week was Hillary’s greatest week of her campaign, even though she was exposed as a liar. But she has her Super PAC helping her out, the American Mainstream Media. Rick Santelli joined the moderators and asked Cruz about the Federal Reserve. Cruz said that the first thing we need to do is audit the Fed and that he is an original co-sponsor of Rand Paul’s Audit the Fed legislation. 2nd he said we need to get back to rules based monetary policy, ending the star chamber that has been engaging in this incredible experiment of quantitative easing. He said we need sound money and monetary stability, ideally tied to gold. Santelli gave the same question to Rand Paul. Paul said, he thinks it’s a huge problem when an organization as powerful as the Fed lobbies against auditing the Fed. Want to talk about income inequality? Let’s see how the Fed causes income inequality. The Fed has been a big problem in society. Free up interest rates. Interest rates are the price of money, we shouldn’t have price controls on the price of money. Santelli then went on to Carson and quoted him saying that he didn’t like government subsidies, because they interfere with the free market, but that he is also in favor of taking oil subsidies and putting them towards ethanol processing. Carson said that first of all, he was wrong about taking the oil subsidy and he has studied that issue in great detail. He says he has concluded that the best policy is to get rid of all government subsidies and get the government out of our lives. Let people rise and fall based on how good they are. All this too big to fail stuff and picking and choosing winners and losers… this is a bunch of cr*p! The debate went into a kind of free for all when tax plans got brought up. Harwood asked Jeb how his tax plan could be better than Reagan’s if like Reagan he would lower the top rate to 28% but unlike Reagan he would lower the capital gains tax to 20% instead of also to 28%? Bush kind of rambled on incoherently about how his tax plan gives the middle class the biggest break, $2000 and if you are a middle class family of 4 making $40,000, you pay no tax at all. His tax plan is an utter mess. He gave no actual explanation of it. I couldn’t understand what he was talking about. On to Rubio, he was asked if his tax plan wasn’t backward since it gives a higher cut to the top 1%. Rubio said, yes, because 5% of a million is more than 5% of a thousand, but people on the lower end get more cuts, child tax credits, and small businesses would get a bigger break and his plan doesn’t tax investments at all. Another mess. It was too complicated for Rubio to explain it effectively. Rand Paul was given 30 seconds after complaining about the rules for who gets to follow up on questions. He asked, what are the rules for following up and Quick said it’s at the moderator’s discretion. Again, this is a bias free group of moderators! Paul said much of the discussion is always about the middle class and his plan is unique in that his gets rid of the payroll tax, shifting it to the business. He then said this would allow middle class people to get a tax cut, if you just cut their income tax, there isn’t much tax there to cut. Cruz broke in and said Rand is exactly right, his plan is a good plan, but that Cruz’s 10% plan also eliminates the payroll tax, eliminates the death tax, eliminates the business income tax, and his 10% flat rate is the lowest personal rate any candidate on the stage has. He said that every citizen could fill out their taxes on a postcard, so we can eliminate the IRS. Becky Quick went back to Trump and said that she found where she read about his attack on Zuckerberg over H1B visas and it was from the DonaldJTrump.com web site. The other moderators started laughing. Non-biased moderators, folks. Trump just nodded. Quick said that the web site says, “Mark Zuckerberg’s personal senator Marco Rubio has a bill triple H1Bs that would decimate women and minorities.” She asked, “Are you in favor of H1Bs or are you opposed to them?” Trump said he’s in favor of people coming into this country legally, they can have it any way they want, call it visas, call it work permits, you can call it anything you want. It’s fine if they come in, but they have to come in legally. Quintanilla asked Trump about gun control, stating that Trump has a permit to carry in New York. He brought up the Oregon shooting and Trump’s comment that if teachers had been armed, they would have been better off, then asked if Trump would be uncomfortable if his employees brought guns to work. Trump said, “Yes, I might feel more… comfortable.” He said that he has a permit, which is very unusual in New York and he does carry on occasion, sometimes a lot, but I like to be unpredictable. The crowd cheered! Then he said, unlike our country, where we’re totally predictable and our enemy, whether it’s ISIS or anyone else, know exactly what we’re doing because we have the wrong leadership. And gun free zones are target practice for sickos. Our young soldiers were killed, not allowed to have guns on a military base. If they had guns there would be much damage and I think gun free zones are a catastrophe and a feeding frenzy for sick people. The moderators tried to stir up more arguments between the candidates by baiting Huckabee and asking him if Trump had the moral authority to unite the country. Huckabee laughed it off and said the last question he needs is one that gave more time for Trump to speak. Then he went on about how he likes Donald and is wearing one of his ties and that Trump would make a better president every day of the week and twice on Sunday than Hillary. Fiorina was asked a long winded, meandering question about 401K programs by a woman named Sharon Epperson. She asked if the federal government should play a larger role in helping to set up retirement plans for workers who don’t have them. Fiorina said no. Every time the government gets involved it gets worse. Companies should provide a good set of benefits if they want to attract good workers. There is no constitutional role for the federal government to set up a retirement plan. There is no constitutional role for the federal government to be setting minimum wages. She went on about how the more the federal government gets involved the worse everything gets and started giving examples, but Sharon Epperson didn’t like having her trick, liberal question obliterated, so she kept butting in saying, “thank you so much, thank you so much,” trying to cut Fiorina off. Quintanilla asked Bush if the federal government should treat Fantasy Sports as gambling. Bush said that he’s 7 and 0 in his fantasy football league. But we’re not gambling. Then he said we need to look at it for regulation, because it’s day trading without any regulation at all. Christie broke in and asked are we really talking about fantasy football? We have 19 trillion dollars in debt, people out of work, ISIS and Al Qaeda attacking us and we’re talking about fantasy football? The crowd gave the biggest applause of the night. Even Cruz was clapping. Christie said, let people play, who cares? Rand Paul was asked about medicare and if Reagan was right to oppose it. Paul’s basic answer was that he had a way to fix it. I expected Paul to support the constitution on this matter, but he didn’t. Huckabee wanted to add that the biggest costs are chronic disease and that if we just find cures for the top four diseases such as cancer and diabetes, we could decrease 80% of all medical costs across the board. He said we cured polio, so you know how much we spent on polio last year in America? We didn’t spend any. All of the other candidates chimed in on medicare with various ideas on how to fix it with general agreement that giving the government more money wasn’t going to fix it. Carson was the only one who had an idea to at least partially privatize it by giving people the option to opt out. Christie commented on the fact that in this debate, at least people had great ideas, whereas in the democrat debate it was all about what they could give everyone for free. He said if they offer you something for free, keep your hand on your wallet! Closing statements went from right to left starting with Rand Paul. He said that liberty thrives when government is small. He will be filibustering the debt ceiling raise tomorrow. Christie wanted to talk to the folks at home and looked into the camera and asked if we’re fed up with how Washington taxes us, wastes our money, are we concerned about how the debt in Washington is endangering America’s future? Are you serious about this election? You need to elect someone who is serious about changing this culture in Washington. Cruz said that everyone is talking about the need to take on Washington, so the natural next question is who actually has done so? He said he stood up to democrats & republicans. When millions of Americans rose up against Obamacare, he was proud to lead that fight. Same with amnesty and Planned Parenthood. Fiorina said that we always hear a lot of talk and good intentions, but somehow for decades, nothing really has changed. What we need now is a proven leader who has produced results. In your heart of hearts you can’t wait to see a debate between Hillary Clinton and Carly Fiorina. Carson thanked all the other candidates for being civil and not falling for the traps. He thanked the audience for attentiveness. People are waking up. America was made for we the people and we should never give away our values for the sake of political correctness. Trump said that our country doesn’t win anymore. We lose on trade, against ISIS, the worst deal he’s ever seen, the recent catastrophe with Iran. We don’t win. He pointed at the moderators and said, these folks at CNBC, they had it down to three, three and a half hours. (The debate) He said that he read they’re charging $250,000 for a 30 second ad. Trump said, it’s ridiculous, no one wants to watch for 3 hours. Talking about CNBC he said that they lost a lot of money, everybody said it couldn’t be done. Everybody said it was going to be three, three and a half hours, including them! (Pointing at moderators) Trump said, no way, and he got together with Ben Carson and in about 2 minutes he renegotiated the debate down to 2 hours, so we can get the he** out of here. Not bad! The crowd cheered. Harwood broke in and said, just for the record the debate was always going to be 2 hours. Trump said, that’s not right, that is absolutely not right. You know that, that is not right. Rubio said that America doesn’t owe him anything. He said that America is special because of the American Dream. He said he can expand the American Dream. Bush said that America is at a cross roads and he has a proven record of success, 32 years in business and 8 years as governor of Florida. He said he will change the culture in Washington and do so in a way to bring people together. He went through a list of talking points about lifting people out of poverty and rising income. Huckabee said that to a lot of people in the media this is just a big game and the candidates are the players, held up in contempt by people who write columns. He said, that there is something deep inside everyone on that stage to cause them to give up their lives and fight for the people of America. Kasich said that we need to rebuild our families and know who our neighbors are. America is great, not from the top down, but from the bottom up. The bottom up is us, in our families and communities. We will renew America if we work together. And God Bless America! Well, I will apologize for this being so long. Thank God Trump negotiated the debate to 2 hours instead of 3! Overall, I thought it was pretty good, with a few tremendous points made that got a lot of audience cheer. There were definitely varying degrees of winners and losers in this debate, but I’ll leave that decision for you to decide. I’ll only say who I saw as the biggest loser in this debate and that was CNBC. The moderators injected themselves into it, argued, tried to trick people into fighting amongst themselves, attempted to force an agenda with false premises, and acted as if it was their job to coerce GOP candidates into capitulating to liberal agendas. So much was about entitlements and how are we going to be able to continue to give away free stuff. I am sick and tired of our debates being moderated by greedy, liberal scum bags. The candidates were all stronger than I expected them to be. Every single one. There was no way to capture it all here, so although this synopsis is very long, it can’t really do any of them justice. There were no real gaffs, but a few of the candidates are really fairly liberal, but even they performed better than any of the democrats did! Hopefully the next debate has fewer candidates and only lasts one hour! Previous The 2nd Amendment: Shall Not Be Infringed! 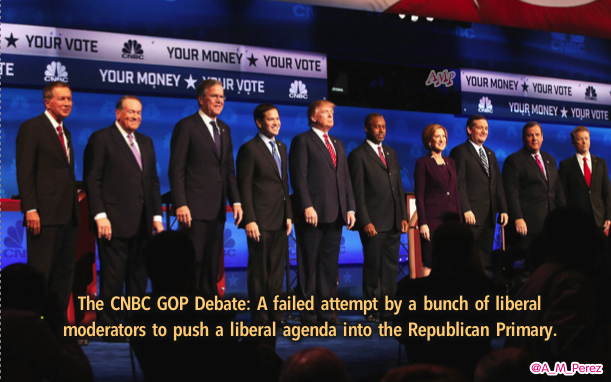 Next GOP Primary Poll – Post CNBC Debate! After reading your synopsis, I wonder if I should have wasted my time watching the original fiasco. The only redeeming feature of it was watching the candidates come together to shred the moderators. John Harwood is a brain dead lib who, along w/ his two sock puppets made total fools of themselves, but they are so indoctrinated, they don’t even know it. Thanks for the great recap. I don’t have cable TV and had another earlier commitment, so I wasn’t able to get to a debate watching party on time. I would love to see a real debate with unbiased moderators and fewer candidates. I doubt that the lower polling ones will drop out any time soon, because they seem to be the establishment favorites, and the media are so liberal it is sickening. No problem! Yup, the libs in the GOP primary all have big establishment donors. And it really is too bad we can’t have Mark Levin as a moderator.